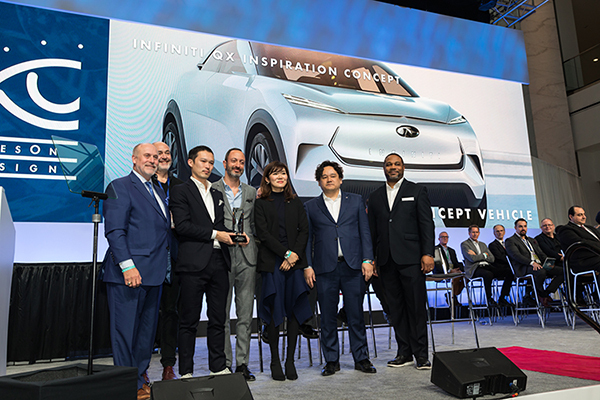 DETROIT January 15, 2019; The INFINITI QX Inspiration Concept today was awarded "Best Concept Vehicle" and "Best Interior" for the second year in a row at the 2019 North American International Auto Show by the prominent collection of automotive designers known as EyesOn Design. The concept also received the "Innovative Use of Color, Graphics or Materials" award. The QX Inspiration concept combines an electrified all-wheel drive powertrain with SUV body and introduces a new INFINITI form language for the electrified era. The annual EyesOn Design Awards, given in seven categories, are selected by more than 30 active and retired design heads of automotive manufacturers and transportation design chairs from top art schools. The awards are considered the validation of great automobile design from the industry's leaders. "The QX Inspiration is the future of INFINITI and showcases the evolution of how Japanese DNA manifests in our design language in the age of electrification for our premium brand. I am so proud of our design teams in our centers around the world. They work so hard, often in obscurity, on these beautiful designs, and this recognition means so much to them. 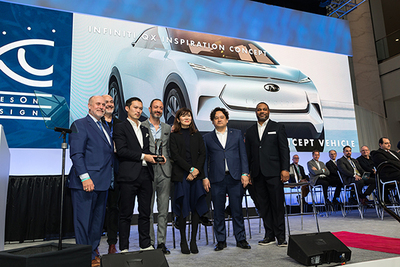 It is extremely gratifying and I could not be more proud," said Alfonso Albaisa, senior vice president of global design at Nissan Motor Co., Ltd.
"The QX Inspiration is the manifestation of our electric ambition and is the culmination of three decades of design and technological leadership. It has been literally thirty years in the making. I'm so proud of the design team that found a way to fuse mid-century modern design with Japanese minimalism. Recognition among peers in the industry is the highest form of praise. We are both humbled and grateful." The INFINITI QX Inspiration concept will be on public display at the 2019 North American International Auto Show, which runs Jan. 14th through Jan. 27th at Detroit's Cobo Hall. Full QX Inspiration concept media information is available from www.infinitinews.com/QXInspiration.